No Family History Feast is complete without hearing how the Public Record Office Victoria (PROV) and National Archives of Australia (NAA) can help us with our research. With the military theme firmly in their minds Charlie Farrugia (PROV) and Darren Watson (NAA) delved into their archives’ collections and came prepared with a showcase of interesting material. Hearing Charlie’s presentation, The Third Front: WWI and beyond in the PROV Collection, I was surprised to hear how many of their records could be useful for military research. PROV hold records relating to the home front, including records covering the Victorian contribution to the war effort (including recruitment and fund raising activities), commemoration (establishment of war memorials, including plans for the Shrine of Remembrance), and soldier settlement files. 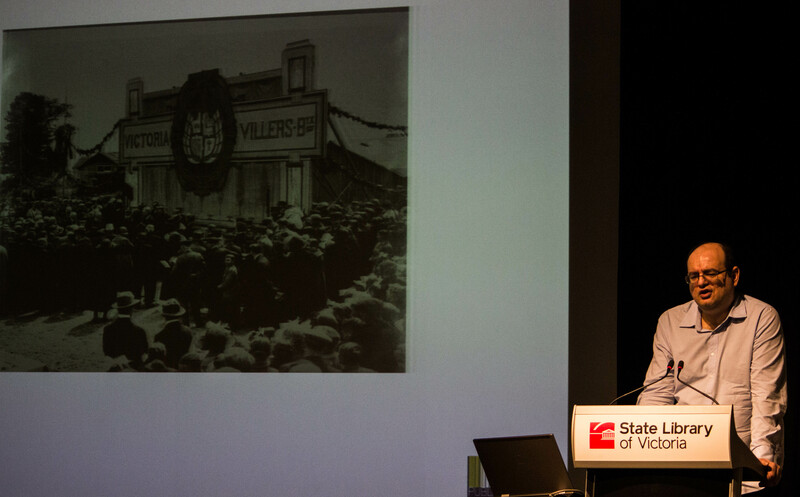 Charlie’s presentation focused mainly on soldier settlement records for World War 1 soldiers. For anyone with a relative involved this scheme, it is well worth pursuing these records as they can contain all sorts of interesting information (such as how successful they were, how much money and livestock they were loaned…etc). A detailed explanation of available records can be found in Lands guide : a guide to finding records of crown land at Public Record Office Victoria, which can be accessed in the State Library’s Genealogy Centre. 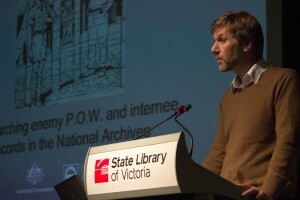 After a lunch break, Darren Watson from the National Archives of Australia was up next with his talk Behind barbed wire: Researching enemy POW and internee records in the National Archives. This was a very interesting presentation which looked at the history of internees and POWS in Australia. An interesting point to note was that conditions varied widely at the different internment camps. Some camps had atrocious conditions, while others were quite reasonable. The internee experience could therefore be extremely different, depending on where they were placed and who was in charge. Stay tuned for my next Family History Feast post Well armed : the military history collection at the State Library. How would I be able to get in contact with Darren Watson, he speaks extensively about my GG grandfather Carl Newman in his barbed wire presentation. I would love to know where this information comes from!